According to the National Association of Anorexia Nervosa and Associated Disorders, Inc., more than 20 million Americans are currently suffering from eating disorders. Eating disorders can affect people of all genders and ages, and they can have a significant effect on a person’s physical health. Eating disorders such as anorexia and bulimia can also affect dental health. Many people who suffer from eating disorders experience severe dental erosion and other dental health problems. A study by the University of Bergen in Norway revealed that anorexia nervosa, bulimia and similar eating disorders are correlated to facial pain, sensitive teeth, dry mouth, dental erosion and other dental health conditions. Frequent vomiting is often a major factor in dental erosion. As stomach acids wash over teeth, they deteriorate the dental enamel. When people brush their teeth immediately after vomiting, the enamel damage is even more profound. However, even those who do not vomit as a result of their eating disorders can also suffer significant dental health problems. A lack of nutrients routinely leaves teeth and gums more vulnerable to decay, gum disease and other oral health problems. 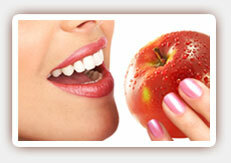 If you have an eating disorder, seeking treatment can help significantly reduce the damage to your teeth. If you vomit, do not brush your teeth immediately, but instead rinse your mouth with water as soon as possible to reduce the amount of acid and length of time the acid has contact with your teeth. Chewing sugar-free gum or sugar-free candies may also help by stimulating saliva flow and neutralizing mouth acids. Our West Hollywood dentist may recommend prescription strength fluoride toothpaste, fluoride mouth rinse or fluoride treatments to further protect your teeth from damage. Contact us today to learn more.